An overnight curfew in the Lebanese capital Beirut, imposed after clashes between students from rival political factions, has been lifted. Four people were killed and more than 150 were injured in Thursday's violence, police said. Street battles were finally quelled when the army fired into the air. The bloodshed overshadowed a foreign donors' conference in which $7.6bn (£3.9bn) was pledged to help Lebanon recover from last year's conflict. The violence started as a row between Sunni supporters of the government and Shia opponents at Beirut's Arab University but it flared rapidly from a student fist fight to violent clashes between local supporters of the two sides. Club-wielding students hurled rocks and other missiles at each other as fighting spread across the capital. Television pictures showed youths moving through the streets, brandishing makeshift weapons and vandalising cars. As the row escalated supporters of the Shia Hezbollah movement called in help, and residents from the local Sunni neighbourhood also joined in. The clashes came two days after three people died in clashes amid a general strike called by the militant Hezbollah group. The violence underlines fears that a major flare-up of civil strife could break out if urgent action is not taken to defuse the explosive political situation, reports the BBC's Jim Muir in Beirut. 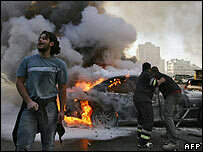 "We are witnessing scenes that remind us of the civil war," said pro-Damascus parliament speaker Nabih Berri. Hezbollah, which is backed by Syria and Iran, has led mass demonstrations and strike action since the beginning of December to try to force Mr Siniora's pro-Western government to resign. But the movement's leader Hassan Nasrallah, urged supporters to evacuate the streets "in the interests of the country and civil peace". 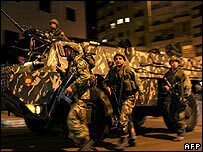 "We call for the measures of the Lebanese army to be respected," he said. Even as the violence was escalating, donors were offering billions of dollars to help Lebanon's recovery following the devastating war between Israel and Hezbollah last year. The biggest pledges came from Saudi Arabia, the US, France and the EU. Lebanese Prime Minister Fouad Siniora, who attended the conference, said he was "really pleased with the level of financial support". However, the BBC's Caroline Wyatt in Paris says the Lebanese government had to promise to implement potentially unpopular economic reforms, which could create further difficulties with the Hezbollah-led opposition.